ODD (Office of Development & Design) has released new campaign work for Golf Pride promoting its MCC Plus4 and CP2 designs, the company’s latest line of golf grips. 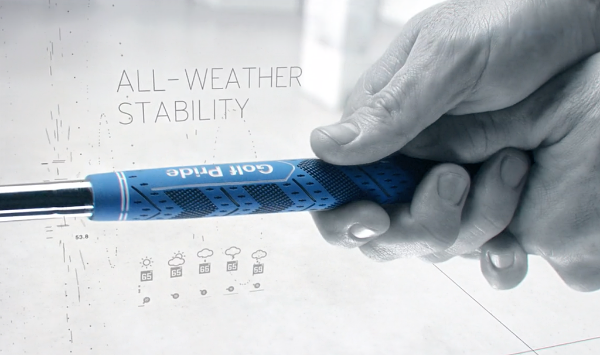 The release marks the third consecutive year that ODD have completed advertising for the global leader of golf grips, delivering a complete 360-package that required shooting, editing, modeling, lighting, texturing and rendering all aspects of the campaign. With that in mind, ODD Director / Creative Director Gary Breslin chose the Academy Award-winning motion control rig Milo to garner mesmerizing visuals that swing, twist and turn around the grips to underline innovative designs. “We constantly revolve and orbit around each grip to keep your eyes on the product as the technology is shown,” say Breslin, capturing hi res footage at 6K resolution on Red Dragon camera gear. As a result, hypnotic camerawork showcases the power possible swinging the MCC Plus4, Golf Pride’s latest grip to win a Major. The feel and control of the CP2 is also observed, the company’s fastest growing grip, comfortable for any golfer swinging from tee to green. Compelling motion graphics are also on display, keeping the eye informed as the movement flows, these subtle yet important effects were added by Territory creative directors David Sheldon-Hicks and Nick Glover, represented by ODD. Breslin looks forward to future work with Golf Pride as its technology continues to innovate. “There is a level of comfort and collaboration with the agency and client that is unprecedented in my career,” he admits, blending high-end professional camera equipment with effects savvy to illustrate golf grip dynamics. Meanwhile, other elements enhancing ODD’s creativity includes work from Ash & Spencer Music in Minneapolis, composing a revised version of the campaign’s melodic line to contemporizing the music and bring a fresh new energy to the sound.